If you’re looking for a great party this weekend at the Walt Disney World Resort, head over to Raglan Road Irish Pub & Restaurant for the Great Irish Hooley. This is the second year for the Great Irish Hooley – which is Irish slang for a party or celebration. The event features Irish food, live music, and even dance workshops. There’s something for the whole family to celebrate this weekend. 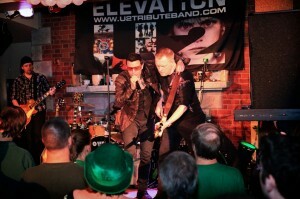 The celebration will feature a lineup of Irish bands including Scythian, Lisa Canny, and Elevation which is the top U2 tribute band. There will also be Irish dance workshops with dancer and choreographer Ronan McCormack who was in the original cast of Riverdance. “Last year’s hooley was such a success that we started planning early this year to invite the best of Irish bands and entertainers,” said John Cooke, a Raglan Road founding partner and native of Ireland. Guests will also be able to enjoy traditional Irish food from celebrity chef Kevin Dundon. The Great Irish Hooley is happening August 30 through September 2 at the Raglan Road Irish Pub & Restaurant. Full details can be found at www.ragalnroad.com or guests can call 407-938-0300 for more information.